Plus, Julian Gollop himself will present on our stages. X-Com creator Julian Gollop will bring his new game Phoenix Point to the PC Gamer Weekender at the London Olympia, 17-18 February 2018. Attendees will be able to get hands-on with the game, and Julian himself will be a guest speaker on the Developer Stage on Saturday at the event. Phoenix Point is Gollop's reinvention of a sub-genre he created. Set on a near-apocalyptic Earth in 2057, you lead a cell of the Phoenix Project, and are tasked with saving the last remnants of humanity from aliens and an enclosing mist that mutates anything it touches. 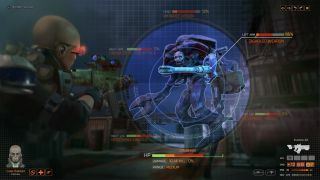 If you loved Firaxis's recent XCOM games, you'll love what the team at Snapshot Games is working on here—come play it in London and see for yourself. Tickets for the Weekender are available here. Look out for tons more information on playable games and guest speakers on PCGamer.com in the coming weeks.